Picking the right tires can be confusing because there are a multitude of choices. Let’s simplify. There are four main classifications of tires, each designed for different purposes. First off, there are summer tires. Those who buy summer tires are looking for maximum summertime performance. The rubber is a little softer to help stick to the road on fast corners on Minnesota roads. The tread has wide blocks at the shoulder to stiffen the tire in turns. The tread design can handle rain, but really isn’t set up for snow and ice. Next comes winter tires.Lakeville people buy winter tires because they still like performance driving when it’s cold and slippery on Minnesota roads, so they need a tread design that’ll really bite into ice and snow. The rubber compound is formulated to stay pliable when temperatures drop below 45 degrees so they get great traction even on dry roads. On the other end of the winter tire spectrum are tires designed to handle in severe ice and snow conditions. 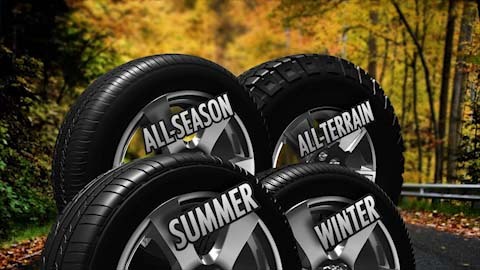 The third category is all-season tires. Most new cars in Lakeville showrooms come with all-season tires. This is a tire that is designed to be used all year round. The tread design and rubber compound is a compromise that won’t give you the extreme capabilities of summer or winter tires, but if you’re driving and weather conditions aren’t at the extreme ends of the range, all-season tires might suit you just fine. The last category is what you might have on your SUV or pickup. All-terrain or off road tires are designed for both highway and off-road use – a tire that gets good traction in the dirt and on off-road obstacles, but still performs well on paved roads. Choosing the right tire is important for car owners. Talk with your HomeTown Auto Service tire professional about your driving requirements and receive valuable guidance on tires that will meet your needs.